Last Friday we examined the fact that gold has now fallen 6 months in a row. Historically, this suggests that gold is at a short term bottom. Meanwhile, silver has started to form a bottom. 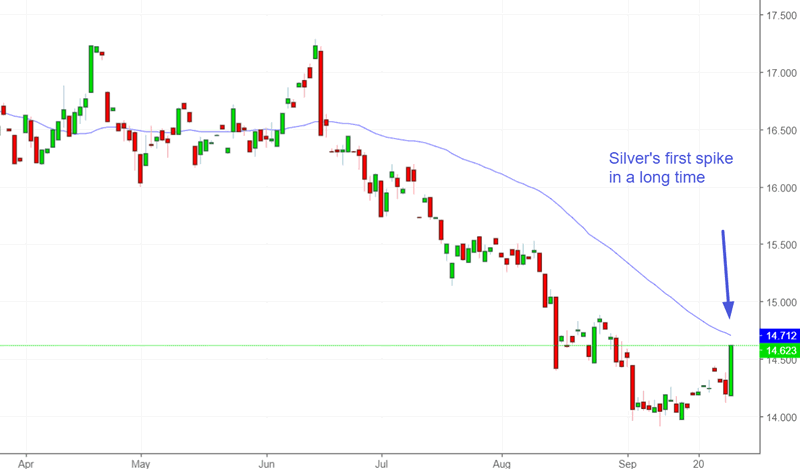 Silver spiked on Friday for the first time in a long time while being in a downtrend. Here’s what happens next to silver (historically) when it spikes >2.9% while being below its 50 daily moving average for at least 3 months (e.g. right now). Gold and silver have been falling for a long time. The bottoming process is a long process. It’s unlikely for gold and silver to shoot straight for the moon right now. Precious metals usually swing sideways for the next 1-2 weeks. As you can see in the above chart, silver’s 1-2 week forward returns aren’t bullish. Silver (and gold) really start to rally 1 month later. Here’s another interesting point to note. Almost all of these historical cases happened during the 1980s, 1990s, and 2010s. Almost all of these cases occurred within the context of large bear markets during which gold and silver were either in a long downwards trend or swinging sideways in a wide range. Almost none of these cases (except October 2008) were followed by a big gold and silver bull market. In other words, this is a sign of long term bearish gold and silver price action. This is probably not the start of a bull market.